Onyx International is one of the bigger E Ink ebook reader companies that’s not named Amazon, Kobo, or Sony. They sell their products mostly in Europe and a few other countries worldwide. Unfortunately the United States is no longer one of them, but Onyx has sold their ereaders here in the past. Charbax from ARMdevices.net just posted a video interview with the CEO of Onyx International. 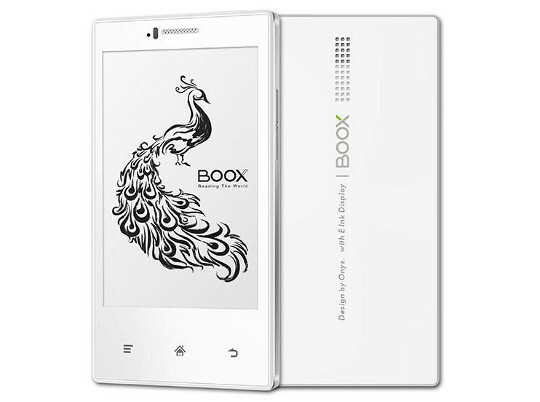 The video shows Onyx’s first E Ink Android phone, the Boox E43. It has a 4.3″ E Ink screen and runs Android 2.3. Onyx says that it is good to go and they are ready to start taking orders from distributors worldwide so that it can be in customers hands in time for Christmas. It will be interesting to see how well the Onyx Android phone performs. It is among the first phones to come with an E Ink screen. The readability in bright light is undoubtedly going to be better than traditional LCD phones, but I’m still skeptical about the overall usability and battery life. The interface looks slow and unresponsive in the video, and the answer about battery life was once again sidestepped. Aside from the phone, Onyx has some new Android-powered ebook readers as well. In fact they are planning to transition all their ereaders to Android. The most interesting new ebook reader described in the video is the Onyx Boox M96. It has a 9.7″ E Ink screen like the M92 and Icarus Excel that I earlier reviewed, but the M96 runs Android 4.0 and is powered by a Freescale i.MX6 Solo Lite single-core ARM Cortex-A9 processor. It also appears to have a finger-friendly touchscreen instead of a Wacom touchscreen. Onyx is ready to start mass-producing the M96 so it will likely become available in the next couple of months. It’s still not listed on the Onyx website, however. One thing to note about Onyx’s Android ereaders is that they are “open”, meaning you can install Android apps to access various ebookstores. They also support ePub and Adobe DRM. In theory. We’ll have to wait and see some actual user reports to know how well it works. The Kindle Android app doesn’t have as many features as Kindle devices or the Kindle for iPad/iPhone app, though. Not even close. Android 2.3? That’s like shipping a laptop with Windows XP! Who could this possibly appeal to? Nathan, Let me offer some observations. I own the M92 and i62HD ML and while the software is Linux based, it’s fast, stable and supports many e-book formats and foreign languages including non-roman characters. The issue that Onyx is faced with going to Android is the new software doesn’t have as a complete feature set as the Linux implementation. The distributor in Europe I purchased my i62HD ML from initially announced the Android based Onyx readers, but then pulled the announcement once he had tried out the Android based unit. Customers are going to be sensitive about going to a new platform where the software does less. Also, Android will not necessarily mean that .apk files from the Google Play store will work since the e-reader hardware does function differently. I think it will be tricky for them to adapt Android to a display that cannot do animations. But if they succeed, it could be a decent product. e-ink is a superior display for reading. BUT if Onyx were smart, they’d avoid Android entirely and court the Linux community, which would get them a few thousand dedicated followers instantly. Linux coders like to write software and Onyx could quickly find many new apps appearing. I’m in the market for a new phone (I really need a new one today) but I would be willing to wait for this phone, or get it later as a second phone. However…. what I really want is a 6 inch e-ink phone. Everyone is saying that 3.5 inches gave way to 4, 4 to 4.5, 4.5 to 5, 5.5 to 6. The truth is, 6 inches is ideal for both phones and e-readers.